"We were on the boat and we saw the whale coming out, and we saw it. It's legitimate -- it hasn't been Photoshopped." A breaching whale has crash-landed on a sailboat in Table Bay, narrowly missing the vessel's occupants and leaving in its wake bits of blubber and thick skin. This picture shows the southern right whale seconds before its massive body landed on the coach roof of the boat, flattening the steel mast and bringing down the rigging before sliding back into the water and disappearing into the distance. "It was quite scary," said Paloma Werner, who had been out sailing with her boyfriend and business partner, Ralph Mothes, of the Cape Town Sailing Academy. "We thought the whale was going to go under the boat and come up on the other side. We thought it would see us." But the boat had its engine turned off. Meredith Thornton, scientist and manager of the Cape Town Mammal Research Institute at the University of Pretoria, said: "Whales don't see much by way of their eyes but by sound in the water." Between the whale's poor eyesight and low visibility in the water, Thornton said the whale, which she believed to be young, probably did not know the boat was in its way. The couple first saw the whale when it was about 100m away. It breached once and, before they knew it, the whale was a mere 10m from their yacht. "There was hardly any wind, so we couldn't get out of the way," said Werner. "We didn't have time to take any evasive action." The yacht, a 10m training boat called Intrepid, is made of steel and did not suffer any structural damage. "If it had been a fibreglass boat it would have been sunk, so we were lucky," said Werner. The whale was seen pounding its tail on the surface of the water just moments before breaching. "It looked like it was angry or something," said Joseph Mbaya, a sailor and tour guide for Yacoob Tourism. He had stopped his boat, Ameera, just 300m short of the whale to take photographs. Thornton said the whale had not been angry, but was probably "lob-tailing" in order to communicate with other whales. "If a whale wanted to be aggressive it would side-swipe the boat with its tail," she said. Two people from Botswana were on Ameera with Mbaya. One of the tourists, who Mbaya knew only as James, captured the moment on his camera just before the whale hit the boat. James gave a copy of the picture to Mbaya as a keepsake and the tour guide brought it to the Cape Argus. After the incident, Mothes and Werner surveyed the damage to their yacht. "The first thing we did was make sure there was no water downstairs. We didn't know if the whale was coming back," said Werner. The couple were contacted by other concerned sailors who had seen the accident, but they were fine. Werner and Mothes then reported the accident to Port Control. The couple managed to turn the engine on and made it back to the marina without assistance. They docked the boat and folded the crumpled sails, asking for help only to move the damaged mast. Thornton said the whale was probably not badly injured. "It's definitely very badly bruised, but probably did not break anything," she said. "It's definitely feeling it today." Thornton said southern right whales could reach up to 15m and could weigh up to 60 tons. They can be seen year-round near the Cape, but are more prevalent at this time of year. They come here to breed," said Thornton. "It's a regular occurrence in winter months." According to Thornton, the population of the southern right whale was healthy and growing steadily. "I think this is something that is going to happen more and more, because the number of whales in South African waters is increasing at the biological maximum, which is 7.5 percent each year." "There are also more and more people using the whales' environment (for) swimming and boating." Werner said the shock of the accident had not hit her until she finally sat down at the end of the day. But she remained upbeat. "It gives a whole new meaning to having a whale of a time," she joked. CBS Evening News with Katie Couric shared the above video on Thursday, offering proof that a southern right whale did, indeed, jump out of the water on Sunday and crash onto the sailboat of a couple sailing off the coast of Cape Town, South Africa. There has been some speculation that perhaps the image posted Wednesday on Outposts as well as on numerous other websites had been Photoshopped. The couple have been speaking publicly about their ordeal. "I never for a minute thought this thing would hit the boat," Mothes added when speaking with Lauer. "Blow me down, suddenly I saw this huge monster shape come up out of the water on my port side and yeah, that's it. I mean, it just happened in an instant. It was quite frightening." Officials from the local Department of Environmental Affairs have launched an investigation into the incident after several people came forward to say the boaters had broken the law by approaching the whale and that the 33-foot, 40-ton mammal was provoked into the attack. Antarctica may not be the world's largest landmass -- it's the fifth-largest continent -- but resting on top of that land is the world's largest ice sheet. That ice holds more than 60 percent of Earth's fresh water and carries the potential to significantly raise sea level. The continent is losing ice to the sea, and scientists want to know how much. Antarctica's ice generally flows from the middle of the continent toward the edge, dipping toward the sea before lifting back up and floating. The point where ice separates from land is called the "grounding line." For scientists, an accurate map of the grounding line is a first step toward a complete calculation of how much ice the continent is losing. 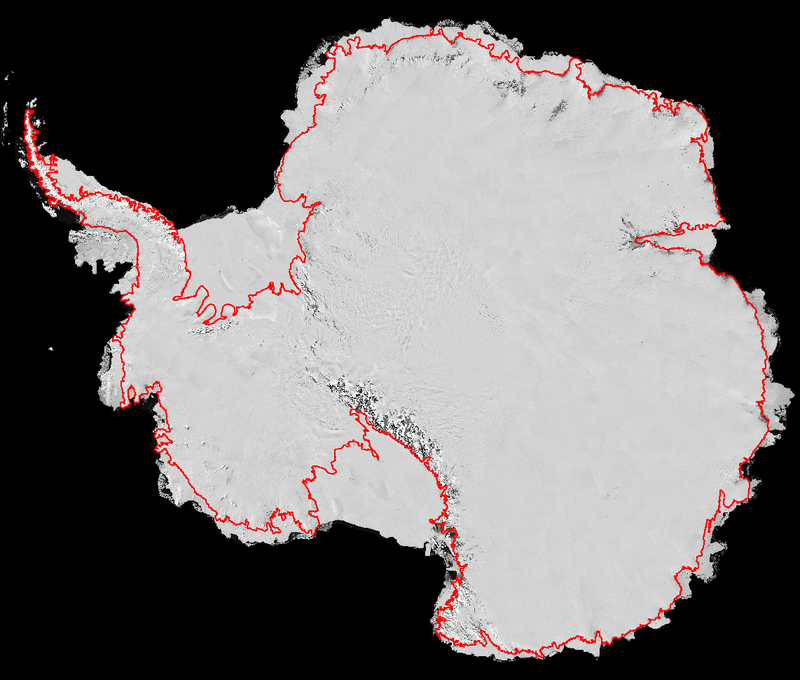 Such a map is a primary objective of the Antarctic Surface Accumulation and Ice Discharge (ASAID) project. Researchers from NASA's Goddard Space Flight Center in Greenbelt, Md., led a team that used high-resolution satellite images, along with newly developed computer software, to trace the most accurate Antarctic grounding line ever compiled. "This project has been a major achievement to come from the International Polar Year," said Robert Bindschadler, a cryosphere scientist based at Goddard who presented his team's work in June at the International Polar Year Oslo Science Conference. "This project included young scientists, it was an international effort, and it produced freely available data -- all from satellites." Much public attention has been focused on the Arctic, where ice loss is accelerating. Antarctica, however, is also steadily losing ice. NASA satellites have shown ice losses around the entire continent, with pronounced changes in the northern region around the Antarctic Peninsula. The most significant changes are likely to occur at the intersection of the ocean and the ice sheets. At what rate is Antarctica's ice is lost to the ocean? It's a tricky question because of Antarctica's immense scale. Previously, researchers calculated the speed of outflow from 33 of Antarctica's biggest outlet glaciers, but that accounts for just half of what is lost, as outlet glaciers makes up only 5 percent of the coastline. The rest of the coastline might lose ice through icebergs that calve off from outlet glaciers or over land cliffs. Sometimes ice flows gently from glaciers that extend far into the ocean as floating ice shelves or skinnier ice tongues. In other cases, the ice never reaches the ocean at all. To draw the new grounding line, the team of NASA and international scientists worked with a mosaic of high-resolution images of the continent from the Landsat 7 satellite. Using software developed by Goddard's Hyeungu Choi, the team collated and mapped points from previously mapped lines, high-resolution imagery, and some new information about surface elevation. "Completion of this line was huge, as we connected 3.5 million geographic points around the continent," said Goddard's Amy Wichlacz, who popped a cork in celebration after eight months of meticulously connecting the dots. The team found that the grounding line around the edge of the ice sheet follows a winding path 53,610 kilometers (~33,312 miles) long. The high-resolution imagery makes the new map more precise than previous assessments of grounding lines, which sometimes mistakenly included shadows and islands as part of the continental landmass. The next step is to use satellite elevation data from ICESat to determine the ice thickness near the grounding line. The new map and elevation data, along with thickness information (once complete), will be turned over to the National Snow and Ice Data Center in Boulder, Colo. Knowing where ice leaves the land, combined with the thickness of ice in the vicinity and speed of the ice, allows scientists to calculate how much ice is being lost. Read this, from Peio Elissalde of the little French geo-informatics outfit Marine GeoGarage: "[We're ushering in] a new era of nautical mapping services with the launch of a marine charts portal built on cloud computing technology." It's probably the first time I've seen the "cloud computing" buzzword in the marine world. Basically, you plug into the information and services you want wherever you have Internet access. All those things that you used to find on your hard drive or your company's proprietary servers? Now they're in the cloud - huge server clusters run by the likes of Amazon, Microsoft, Google or IBM. The crazy idea Marine GeoGarage had was to give marine chart users an online account, from which they can access the latest updated charts from a number of international hydrographic services. The way Marine GeoGarage builds the chart views for users, and how users interact with them, uses cloud computing technology. Elissalde put it best: "You don't own charts anymore, just use them and share them anytime, anywhere you are via computer, mobile phone or any other Internet device." Google Maps for mariners, in other words. Meanwhile, another guy named Tim Thornton of TeamSurv has a complementary idea. They want to crowdsource hydrographic data. If you put some sensors on any commercial ship or leisure craft to record depth and such, and gather this data based on its location, you have the foundation for making and updating marine charts. Imagine a hydrographic service with thousands of ships creating a firehose of new data, instead of a couple ships with multi-beam echo sounders mowing the proverbial oceanic lawn. It's not too great a stretch to imagine TeamSurv feeding hydrographic data into the cloud, with hydrographic offices providing norms and quality certification, so suppliers like Marine GeoGarage can package value-added services. Yes, both companies are initially focusing on the light marine market; that's where much of our innovation comes from. In fact, there's every reason to believe the above model resembles the future. Some chart suppliers are preparing themselves for a future a lot like this. What can the rest of the industry learn from this example? Anyone who can scale services worldwide around a core pool of data or functions, and fashion it into a subscription model service, for example, would be wise to explore a cloud model. Brokers, box-ship operators, even component suppliers, could exploit this. What if you could log in to your vessel from any Internet connection and pull down real-time operating data, with comparisons to similar plants? The core idea is turning what used to be assets that you had to own and maintain into services you basically rent. Hardware and infrastructure will follow. For one client, we held a workshop positing "Propulsion as a Service". Cloud propulsion may be a bridge too far, but it gets minds racing. [5/28/10 3:02:37 PM] redwood.skinner: Hi Peio! [5/28/10 3:03:37 PM] redwood.skinner: Are you there? [5/28/10 3:05:05 PM] redwood.skinner: First question: who is this product meant for exactly? [5/28/10 3:05:50 PM] Peio Elissalde: At firts, our website is dedicated to any sailor or mariner who plans to study his next trip at sea, comfortably installed at home. [5/28/10 3:06:18 PM] redwood.skinner: in other words, primarily leisure craft sailors? [5/28/10 3:07:40 PM] redwood.skinner: ok. do i understand correctly that access to many charts is free, with access to others (chart premium) at a cost? [5/28/10 3:08:33 PM] Peio Elissalde: Yes some Hydrographic Services (UKHO, CHS, AHS..) don't intend to display their charts publicly. [5/28/10 3:09:04 PM] Peio Elissalde: So we provide a 'private' access via some monthly subscription. The reason is because Marine GeoGarage is required to royalty fee to display them online. [5/28/10 3:09:19 PM] redwood.skinner: how does the 9.9 EUR/month fee stand up to competitors' offers? [5/28/10 3:10:01 PM] Peio Elissalde: You mean comparatively to official WMS servers from the Hydrographic Services ? [5/28/10 3:10:12 PM] redwood.skinner: for example. [5/28/10 3:10:43 PM] Peio Elissalde: Do you know other web services ? [5/28/10 3:11:03 PM] redwood.skinner: no. [5/28/10 3:11:53 PM] Peio Elissalde: That's the reason why I haven't set this price comparatively to professional WMS access. The purpose is not the same. [5/28/10 3:12:47 PM] Peio Elissalde: But as we are a pioneer in matter of nautical charts display online, difficult to imagine what is the real price of the market. [5/28/10 3:13:07 PM] redwood.skinner: OK. you mentioned Cloud computing technology and then GeoGarage servers. Is the data "in the cloud" or on your servers? Can you help me understand this? [5/28/10 3:15:07 PM] Peio Elissalde: That's exact there is some difference between classical client/server and Cloud Technology. [5/28/10 3:15:58 PM] redwood.skinner: OK, but what about your service is in the cloud, so to speak? [5/28/10 3:17:26 PM] Peio Elissalde: The Cloud computing part of the service provides some resources in back-end to ensure regular processes for updating the charts. And the ressources we use are dynamically scalable for accepting more chart data for example or future additional web services. [5/28/10 3:18:34 PM] redwood.skinner: So it looks to me like you're laying HOs raster charts over a Google Earth presentation, and then allowing some manipulation. Is that it? you don't "own" anymore the charts, just "use" them and share them, anytime, anywhere you are via computer, mobile phone or any other Internet enabled personal device. [5/28/10 3:19:21 PM] redwood.skinner: Right. What kind of user numbers are you seeing so far? [5/28/10 3:19:24 PM] Peio Elissalde: Google Earth is a stand-alone application, Google maps is the application accessible with some web browser. [5/28/10 3:20:39 PM] Peio Elissalde: The web has just started at the beginning of March so 3 months old. [5/28/10 3:21:52 PM] redwood.skinner: OK. And what kind of usership did you see from that app? [5/28/10 3:23:03 PM] redwood.skinner: what's the business plan, exactly? where does GeoGarage plan to make its revenue? [5/28/10 3:23:07 PM] Peio Elissalde: We have not push a lot regarding communication for the marine press for the moment because we prefer to study the increasing of the charge. [5/28/10 3:23:44 PM] Peio Elissalde: Marine GeoGarage uses a Freemium business model -mix of ad supported and subscription-, offering these Web services (described above) for free while charging a Chart Premium for accessing to certain nautical charts layers and certain privileges. [5/28/10 3:24:29 PM] Peio Elissalde: The other wy to earn money is the Mobile side : we have just released the first iPad/iPhone application for New Zealand. [5/28/10 3:25:47 PM] redwood.skinner: Interesting. So you get a little mark-up from the fee-based charts. Would you prefer these charts go free (to increase usership) or prefer them stay on a royalty basis so you have that revenue stream? [5/28/10 3:26:21 PM] Peio Elissalde: Personnally, I would prefer that all charts go to free. [5/28/10 3:27:19 PM] Peio Elissalde: I guess this is a way among other to struggle against nautical maps piracy onboard, proposing up-to-date charts for the user. [5/28/10 3:28:26 PM] redwood.skinner: how exactly does the machinery work? i mean, you have the google maps as API presumably, then how do you put the raster charts over them? Are you buying licenses, then hosting on own server and presenting? Or is the machine calling up the chart from (for example) NOAA as people access it through GeoGarage? How's this work? [5/28/10 3:31:40 PM] redwood.skinner: ??? [5/28/10 3:31:42 PM] Peio Elissalde: Actually, our tile map server is composed of a static set of tiles, each one having a size of 256 pixels x 256 pixels. These small and regularly sized tiles form together on a screen a partial visual representation of some area at different levels of scale. [5/28/10 3:33:32 PM] Peio Elissalde: Only the tiles needed to display the area currently on the screen are transported over the network. The client/server communication is fast because the system is deterministic: all the tiles have been pre-generated so there is not any ‘on the fly’ calculation process such as in the WMS server (Web Map Service) which returns a section of a map based on the request with specified geographic coordinates. All the tiles are prepared in advance for a fixed area in fixed zoom levels, so they are immediately available (no waiting as in the case of dynamically generated WMS requests). [5/28/10 3:33:50 PM] Peio Elissalde: So the tiles are pre-generated instead of per-user way (WMS case). [5/28/10 3:34:54 PM] redwood.skinner: would that mean that you are uploading the HO charts and updates onto your servers, then these are presented on the Google Maps infrastructure (as you say, pre-generated)? [5/28/10 3:35:30 PM] Peio Elissalde: Yes exactly in the same way. [5/28/10 3:35:59 PM] redwood.skinner: I guess there's no way you're going to do the same thing with vector charts? [5/28/10 3:37:19 PM] Peio Elissalde: But today I'm not sure Google is rendering the tiles in a pre-generation way but certainly on the fly using cache on their big servers. [5/28/10 3:37:38 PM] Peio Elissalde: You mean with ENC ? [5/28/10 3:37:45 PM] redwood.skinner: Yes. [5/28/10 3:39:00 PM] Peio Elissalde: Yes we have already done this with all the NOAA ENC but for technical reasons we are obliged to render the vector charts in raster. [5/28/10 3:39:15 PM] redwood.skinner: files too large? [5/28/10 3:40:40 PM] Peio Elissalde: No this is only a problem of presentation. [5/28/10 3:42:01 PM] redwood.skinner: OK. New question: You have deals with NOAA, UKHO, etc. What's preventing you from signing up with all the HOs from Oman to Croatia, Japan and Chile? Time and trouble? Contracting? Expense? [5/28/10 3:42:07 PM] Peio Elissalde: The other issue is exceptly NOAA and UKHO all the other Hydrographic Services consider that the ENC data is only for ECDIS. [5/28/10 3:43:01 PM] Peio Elissalde: So distributed by Primar in s-63 encryted format for registered ECS or ECDIS. [5/28/10 3:43:20 PM] Peio Elissalde: Good question. [5/28/10 3:45:46 PM] Peio Elissalde: - some HS service haven't study the possibility to distribute charts for web/mobile applications. So they need to study that on a legal form and a commercial form. [5/28/10 3:47:24 PM] redwood.skinner: Have you gotten any interest from traditional chart suppliers, who might want to buy you and add you on to their own service portfolio? Or do they all just see you as competition? [5/28/10 3:48:59 PM] Peio Elissalde: To buy us ? [5/28/10 3:49:57 PM] redwood.skinner: Yes, as a home/office route planning interface, for example. I'm thinking about industrial users here. [5/28/10 3:51:54 PM] redwood.skinner: when did you guys start up with this whole business? [5/28/10 3:52:21 PM] Peio Elissalde: Another idea (totally different) would be you use our nautical chart website (and its growing number of users) as a marketing tool to promote their charts. The idea would be that a 'specific seller' layer is proposed to our users showing all your charts with a direct link to your website for purchasing CDs and paper charts. [5/28/10 3:53:43 PM] redwood.skinner: OK. Like a shopping mall of sorts. [5/28/10 3:54:55 PM] Peio Elissalde: Actually I worked since 1986 in Electronic Marine Navigation (I started in 1986 with MaxSea), then I develop with my associate Loic (an other former member of MaxSea) the first 3D seafloor mapping software in 1998. [5/28/10 3:55:55 PM] Peio Elissalde: Actually our goal is to host all the nautical charts in the world (like Google Maps is doing for land maps and aerial/satellite imagery). [5/28/10 3:57:05 PM] redwood.skinner: A single source of supply for all nautical chart needs (except ENC)? Something like that? [5/28/10 3:57:49 PM] Peio Elissalde: Not supply but only viewing. [5/28/10 3:58:23 PM] Peio Elissalde: I guess the vector data which is the future of e-navigation is also concerned. [5/28/10 3:58:40 PM] redwood.skinner: Right, viewing, with immediate access to the supply. [5/28/10 3:59:12 PM] redwood.skinner: I didn't understand the e-navigation statement. what did you mean? [5/28/10 3:59:41 PM] Peio Elissalde: But Hydrographic Services must change their mind concerning the availability of ENC for web/mobile applications. [5/28/10 4:00:27 PM] redwood.skinner: You mean it would be good to allow viewing of ENCs AND raster charts with the full functionality at Marine GeoGarage. [5/28/10 4:02:58 PM] redwood.skinner: OK, Peio. This has been good. I appreciate you taking the time. And I believe this may make an interesting post for the blog. I will also start following marine geogarage's blog. Interesting stuff for those interested in charts. [5/28/10 4:03:15 PM] redwood.skinner: Have a nice weekend! [5/28/10 4:03:25 PM] Peio Elissalde: Thanks. The blue holes of the Bahamas yield a scientific trove that may even shed light on life beyond Earth. If only they weren’t so dangerous to explore. As a teenager, camera in hand, he explored Florida's underwater labyrinths to capture images of this unphotographed realm. He developed and refined the technique he became most known for: using multiple slaved strobes to dramatically illuminate and photograph this never-before-seen environment. Later, as explorations led Skiles to remote locations around the world, he would strive to employ the latest technology, enhancing his ability to explore the environment and return with stunning images. He's participated in caving and cave-diving expeditions in Mexico, Brazil, Puerto Rico, and Australia. As an expedition cameraman, Skiles specializes in capturing images of people and wildlife on the edge of extreme frontiers. His visual imagery provides the viewer with an intimate understanding and unique perspective of his subjects. Skiles works on assignment as a freelance photographer for National Geographic magazine. His work has also been featured in Outside and numerous diving publications. Skiles is equally skilled in the art of telling stories though moving pictures. He has produced, directed, and filmed over a hundred television films, many of which have won international awards and acclaim. Scientists who study the Arctic's icy cap now have a new weapon at their disposal -- nuclear-powered Navy submarines. Civilian researchers have signed an agreement with the Navy to revive a dormant program that uses the vessels to collect information on parts of the Arctic's ice and ocean that normally lie beyond scientists' reach. Called SCICEX -- short for "Science Ice Exercise" -- the program began in 1993 when the USS Pargo carried five civilian scientists to the Arctic on a test cruise. But after six years and five additional dedicated science cruises to the far north, project SCICEX sputtered. "When the Cold War ended, the Department of Defense really turned its attention to lower latitudes," said Jackie Richter-Menge, a sea ice expert at the Army Corps of Engineers' Cold Regions Research and Engineering Laboratory in Hanover, N.H. "There wasn't really the support to continue that level of support to the scientific community." Instead of providing submarines for planned science missions to the Arctic, the Navy conducted four "scientific accommodation missions" between 2000 and 2005 -- collecting information during brief pauses in classified submarine exercises. For the last five years, the submarines -- part of a force stretched thin by conflicts in Afghanistan and Iraq -- have not gathered any data. At the same time, the Arctic has seen dramatic warming that led to a historic low in summer sea ice in 2007, when its areal cover dropped roughly 40 percent below the 30-year average. Scientists have also documented shortening of the region's snow season, rising land surface temperatures and warmer permafrost, and changes in the population and habitat of polar bears, walruses, seabirds and other Arctic wildlife. 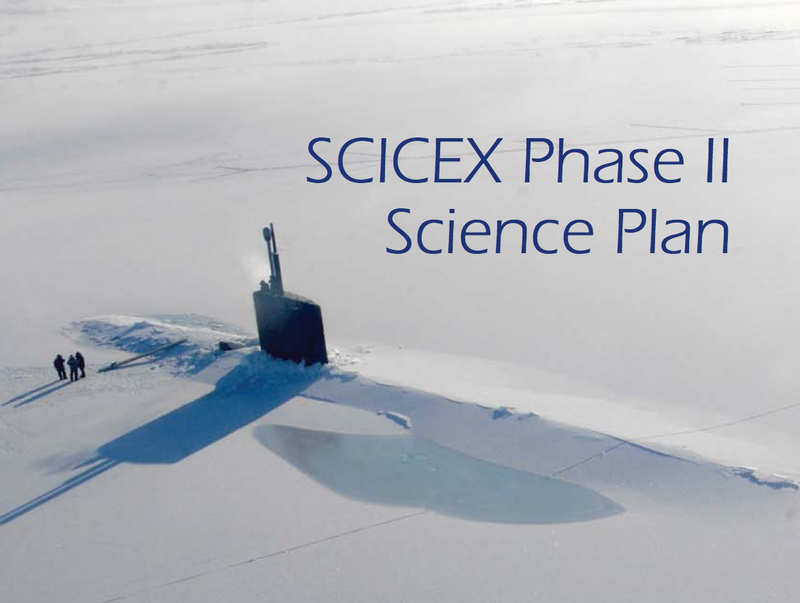 Now, with the Arctic's transformation in mind, scientists and the Navy are collaborating to restart the SCICEX program -- with constraints. Richter-Menge heads a scientific advisory committee that just released a detailed wish list for Arctic data, ranging from measurements of "ice draft" -- how much of the region's sea ice cover lies submerged below the ocean's surface -- to measurements of ocean chemistry, maps of the ocean floor and information on marine microbes. The idea is to provide a prioritized list for the Navy, which will collect data as time allows on otherwise classified submarine missions. Security concerns prevent advance planning of science activities aboard the subs. "The goal was to carve out some small amount of time on those planned missions," Richter-Menge said. "There was a general understanding, both from the military standpoint and the scientific standpoint, that you still have to understand the environment." Reviving the SCICEX effort fits in the with Navy's renewed interest in the Arctic. The region's continuing thaw has positioned the region as a potential future hotbed of tourism, shipping, energy and mineral exploration -- and an emerging military frontier. With scientists predicting Arctic summers could be ice-free by the 2030s, the ensuing resource grab could increase the potential for competition and conflict between nations, the Navy's Task Force Climate Change warned in its Arctic strategy, released last fall. "We really want to understand when changes will be significant enough to provide for increasing access to shipping, resource exploitation and future increased engagement in that region," said Capt. Tim Gallaudet, the task force's deputy director. In the Arctic, "the players are a little more dynamic now," he saaid. "We're seeing non-Arctic players now. China has an ice-strengthened research vessel." For scientists, the advantage of SCICEX lies in harnessing submarines that can travel at high speed and operate even in areas that are covered by ice -- missions that would otherwise require use of icebreaking ships, which are in short supply. And though satellites can cover more ground and easily document multiple snapshots in time, Richter-Menge said the submarine data would be invaluable to help "ground-truth" measurements collected high in the sky. "The submarine has the advantage of looking up at the ice from underneath," she said, "When they take an ice draft measurement, they're measuring nine-tenths of the ice cover, and they're more accurate." With satellite measurements, scientists must apply a mathematical formula to convert the portion of sea ice that sits above the water line -- roughly one-tenth of total ice volume -- to determine how much ice bobs in the Arctic Ocean. The submarines can also collect data on ocean chemistry that satellites cannot. "What it does is gives us a great validation point for [computer] models that are being built to make sea ice forecasts," Richter-Menge said. "Those models, our ability to do that, are important for a variety of reasons: global climate change, the role that sea ice plays in the climate, the whole issue of operations with ships traversing the Arctic, be that for tourists or trade or anything like that." The renewed SCICEX program will operate under a memorandum of understanding inked in 2000 between the National Science Foundation and parts of the Navy. The new science plan calls for collection of baseline data on the Arctic's ice canopy and seafloor and the physical, chemical and biological properties of Arctic seawater. Navy technicians will gather the data using instruments already installed on the submarines during direct transits across the Arctic Basin, from the Atlantic to the Pacific or vice versa. The submarines will also have an opportunity to collect data during biennial exercises in the southern Beaufort Sea, called ICEX, for which the Navy establishes an ice camp. But more than 400 years after explorers like Sir Francis Drake and Sebastian Vizcaino made some of the first maps of California's spectacular coastline, state and federal scientists are embarking on a new project to construct the most detailed map of the California coast ever assembled. "We need a better sense of what's out there. We need a modern map. And with a modern map we'll have the knowledge to make better decisions," said Doug George, a project manager with the Ocean Protection Council, a state agency in Oakland that approved $2.75 million toward the project last month. The images will be so sharp the map should be able to discern individual boulders and telephone poles, George said. The data will provide a baseline to measure everything from the impact of rising oceans over the coming decades, to beach erosion, to flooding risks from large winter storms. The mapping work, supervised by the National Oceanic and Atmospheric Administration, will start next month and is expected to conclude by December, with the images posted to the Internet by next summer. Over the decades, there have been many detailed photo sets and maps produced of sections of the coast. But there isn't a single, high-resolution topographical map of the complete California shoreline generated at the same time using uniform standards. "The baseline is a critical piece. You can't monitor anything if you don't have a good starting point — and we don't have a good starting point," said Sam Johnson, a research geologist working on the project with the U.S. Geological Survey in Santa Cruz. Apart from studying erosion and sea level rise, the images also will be used by agencies such as the California Coastal Commission, state parks, or cities to plan wetland restoration, floodplain management, storm water management, better public access to beaches and coastal development. Every few years, heavy storms cause cliffs to erode in places like Pacifia, Capitola and Goleta. Beaches in San Diego and Orange County wash away. Better information could help prioritize projects in those places, supporters of the map effort say. "California's coast has gone through some dramatic changes over the last 150 years. Beaches erode and grow, bluffs collapse," said Johnson. "Every place is different. You might lose 20 meters of beach over 50 years, or it might happen all at once." The high-tech tools used in the mapping may have generated your last speeding ticket. Known as Light Detecting and Ranging, or LiDAR, the technology is similar to what police use to nab speeders. Researchers shoot harmless pulses of light from the aircraft, and images are generated by computing the amount of time it takes a pulse to leave the plane, travel to the ground and return to sensors. Each data point has a longitude, latitude and elevation. And where many satellite maps might have one data point every 100 feet, LiDAR images can provide one data point every 3 feet or less. In addition to the coast, the project will also take images of San Francisco Bay. "This is absolutely cool. I have a picture on my wall of a 1770s map of San Francisco Bay. It looks like the results of a lower digestive tract x-ray," said Will Travis, executive director of the Bay Conservation and Development Commission, a state agency that regulates development around the bay. "But from the perspective they had, without aerial photography, it was very reasonable. You look at that next to a USGS map, and you see how much more precise and realistic it is. This is taking it to the next generation." The ocean already has risen 8 inches over the past 100 years, as measured by tidal gauges at Fort Point in San Francisco. Computer models run by the Scripps Institution of Oceanography, the U.S. Geological Survey and other research centers predict at the current rate of global warming, sea level could rise another 55 inches — or nearly five feet — by the end of this century as ice sheets continue to melt and the warmer ocean water expands. The infrared laser beams don't penetrate water well. So researchers hope to combine all the images from land, which will extend inland from the water to about 30 feet in elevation, with other sets of sonar images of the ocean floor that USGS, NOAA and Cal State Monterey Bay have been collecting from boats since 2005. "Our goal is to have a seamless map of the land and sea," said George. "That's the holy grail everyone is looking for to help with research on sea level rise, tsunamis, all kinds of work." Findings could be used to figure out where to build sea walls, or expand wetlands to reduce flooding, or where to move existing development. "The next step we want to do is an assessment of vulnerability of various resources to sea level rise — airport runways, Silicon Valley, the Embarcadero in San Francisco, Treasure Island," said Travis. "And you can't do that unless you know the exact height of everything." After years of surprising scientists with their cleverness and smarts, some octopuses appear to also use tools. Veined octopuses observed off the coast of Indonesia carried coconut shell halves under their bodies, and assembled them as necessary into shelters — something that wasn’t supposed to be possible in their corner of the animal kingdom. In captivity, some species of octopuses have solved mazes, remembered cues and passed other cognitive tests typically associated with advanced vertebrates. More anecdotally, they’re known for popping aquarium hoods, raiding other tanks and demonstrating what might be called mischief. All this has come as a bit of a surprise to scientists. After all, octopuses are descended from mollusks. They’re more closely related to clams than to people. They’re not supposed to be smart. But it’s hard to argue with the evidence, and in recent years, researchers have grappled with the possibility that octopuses can even use tools. Such definitions are inevitably ambiguous. But there’s no ambiguity in the veined octopuses found flushing mud from buried coconut shells, stacking them for transport — an awkward process that required the octopuses to walk on tiptoe with the upturned shells clutched beneath them — and finally turning them into hard-shelled tents. “The fact that the shell is carried for future use rather than as part of a speciﬁc task differentiates this behavior from other examples of object manipulation by octopuses,” wrote the researchers. With their tents, the veined octopus has joined chimpanzees, monkeys, dolphins and crows in the ever-expanding menagerie of non-human tool users. But as significant as the finding may be, the moment of discovery wasn’t exactly solemn. Divers have found bottles of champagne some 230 years old on the bottom of the Baltic which a wine expert described Saturday as tasting "fabulous". Thought to be premium brand Veuve Clicquot, the 30 bottles discovered perfectly preserved at a depth of 55 metres (180 feet) could have been in a consignment sent by France's King Louis XVI to the Russian Imperial Court. If confirmed, it would be by far the oldest champagne still drinkable in the world, thanks to the ideal conditions of cold and darkness. 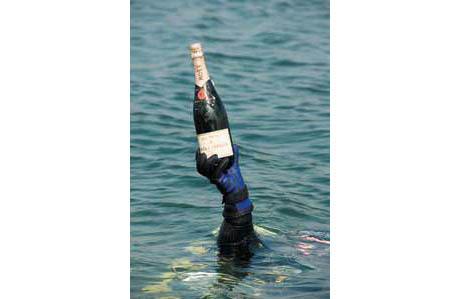 "We have contacted (makers) Moet & Chandon and they are 98 percent certain it is Veuve Clicquot," Christian Ekstroem, the head of the diving team, told AFP. "There is an anchor on the cork and they told me they are the only ones to have used this sign," he said, adding that a sample of the champagne has been sent to Moet & Chandon for their analysis. The group of seven Swedish divers made their find on July 6 off the Finnish Aaland island, mid-way between Sweden and Finland, near the remains of a sailing vessel. "Visibility was very bad, hardly a metre," Ekstroem said. "We couldn't find the name of the ship, or the bell, so I brought a bottle up to try to date it." The handmade bottle bore no label, while the cork was marked Juclar, from its origin in Andorra. "So it can't be before 1782, and it can't be after 1788-89, when the French Revolution disrupted production," Ekstroem said. Aaland wine expert Ella Gruessner Cromwell-Morgan, whom Ekstroem asked to taste the find, said it had not lost its fizz and was "absolutely fabulous". "I still have a glass in my fridge and keep going back every five minutes to take a breath of it. I have to pinch myself to believe it's real," she said. "There's a lot of tobacco, but also grape and white fruits, oak and mead," she said of the wine's "nose". As for the taste, "it's really surprising, very sweet but still with some acidity," the expert added, explaining that champagne of that period was much less dry than today and the fermentation process less controllable. "One strong supposition is that it's part of a consignment sent by King Louis XVI to the Russian Imperial Court," Cromwell-Morgan said. "The makers have a record of a delivery which never reached its destination." That would make it the oldest drinkable champagne known, easily beating the 1825 Perrier-Jouet tasted by experts in London last year. Cromwell-Morgan estimated the opening price at auction of each bottle at around half a million Swedish kronor (53,000 euros, 69,000 dollars). "But if it's really Louis XVI's wine, it could fetch several million," she added. The remaining bottles, which could number more than the 30 uncovered by the divers, will remain on the seabed for the time being. Their exact location is being kept secret. Meanwhile local authorities on Aaland will meet Monday to decide who legally owns the contents of the wreck. The archipelago at the mouth of the Gulf of Bothnia belongs to Finland, though it enjoys autonomy from Helsinki and its inhabitants speak Swedish. A Chilean still wine producer, Vina Casanueva already produce the Cava Submarinas wines which have been aged at the bottom of the ocean.